Former AFC Leopards SC trainer Ivan Minnaert has set his sights on becoming Hearts of Oak coach ahead of the 2017/18 Ghana Premier League. The Rainbow Club coaching job became vacant after the sacking of Frank Nuttal last week. And experienced Belgian trainer Ivan Minnaert has expressed his interest in replacing the Scotsman as he aims to return the club to its former glory days. "Hearts of oak is a big name and I always wished to work with the top and best in the country so I was in Mali with Djoliba, in Kenya with AFC Leopard and in Guinea with AS Kaloum," he told Ash FM. "My presence has always being to revive the team and I think that is what Hearts of oak needs now." He added, "We played Hearts of oak in the 2015 CAF confederation Cup league and beat them in Accra." "Despite the fact that we could not qualify, the Accra fans gave us standing ovation for our performance, the action of the fans impressed me." The Phobians have not won any major trophy for the past eight seasons and have sacked about 8 coaches within that period, with most sacks being precipitated by supporters' agitations. "In my entire career as a coach, I have been met with pressure everywhere I've gone," he said. "It is part of the game but the only thing is to stay positive, focus on the job and move forward". 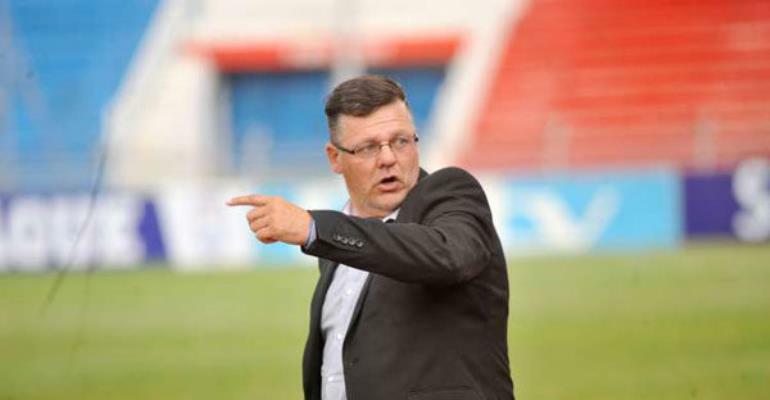 Ivan Minnaert, after leaving Djoliba of Mali, joined AFC Leopard of Kenya but was sacked following a spate of poor results. He later joined the Guinean giants AS Kaloumn from Rwandan side Mukuria Sports. He came close to winning the league but lost the title as Horoya AC claimed the title early before the league ended due to superior point difference.